Experience Luxury Aboard a Yacht – which Includes a Submarine! Master Stateroom: (Main Deck Full-beam) Split-level stateroom with 180 degree panorama view from the king sized bed with a 42½ Plasma TV. On the lower level, a lounge with a 42½ Plasma TV and his and hers ensuite bath with hot tub. Her bath has a 32½ Plasma TV (DVD/CD/Sat TV). Main Salon & Dining: A light and airy feeling is created by the open plan main salon and dining room with hand painted ceiling murals. Forward is a large formal dining table for 10 guests, while the aft section is devoted to comfortable living with ample seating and a full entertainment /Sat-TV system. A highly finished traditional interior, featuring raised paneling in American Cherry, Maple Burl and Figured Bubinga with a classic and understated hand polished finish. Sun Deck: Vast sundeck sporting an enormous sun pad, swim-up bar adjoining spacious hot tub, BBQ, enclosed day head, exercise equipment and dining seating for 12. “Movies under the stars” with Plasma Sat-TV. Sky Lounge: Warm, welcoming setting with hand painted ceiling murals featuring a surround sound theatre system utilizing a 60½ Plasma TV with CD, DVD & Sat-TV. There is a day head to starboard. The sky lounge opens out onto a covered aft deck through two electric sliding doors. 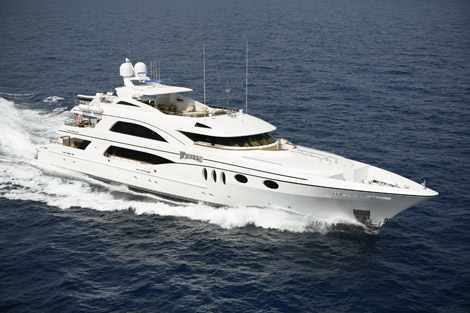 Upper Aft Deck: This area features formal dining for 10 guests, ample casual seating, as well as a 60½ Plasma Sat-TV. V-Sat “Always on” Wireless Internet throughout. Central music system with I-Pod input. Independent Satellite TV in all guest staterooms & common areas, Include 60½ Plasma TV in Sky Lounge, DVD Players at all locations with Kaleidoscope video & music storage. THIS YACHT IS NOT OFFERED FOR CHARTER TO U.S. RESIDENTS WHILE IN U.S. WATERS. Details are thought to be reliable but not guaranteed.